The Psychotronic Zone: Can Cats Act? Toto the Dog was crucial to the plot of The Wizard of Oz, but in the Turkish Wizard of Oz, he was just there. The feline in this movie is called Sampson and it plays an important part in Cat in the Cage, but unfortunately no one told the cat. In scenes where it is called for it to attack, the cute lil fuzzy wuzzy just purrs, so they slap on an audio tape of a crazed kitty, and toss the cat. 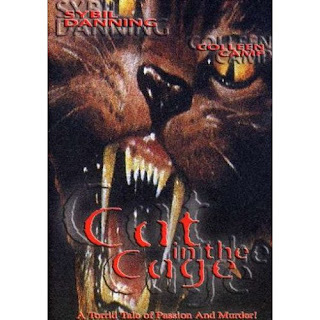 Cat in the Cage is a cliched murder mystery. A son who has just been released from a mental institution believes that his new younger sexier stepmother (Sybil Danning) had something to do with his mothers death. The cat thinks so too.